For those of you who'd rather not blindly buy into a new intellectual property no matter how cool its premise is, time-traveling FPS Darkest of Days now has a demo up on Xbox Live. Darkest of Days is a first-person shooter from developer 8monkey Labs and publisher Phantom EFX featuring a time-travelling protagonist who must set time streams right using an assortment of both period and futuristic weaponry. Take this demo, for instance. 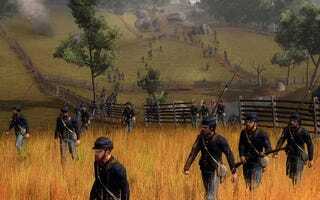 The same one released for the PC back in August, it runs the character through a tutorial mission and then drops them in the middle of the Civil War battle of Antietam with a primitive musket, before letting them cut loose later on with a fully automatic machine gun. It's a beautiful thing. The demo is available to Gold Xbox Live subscribers right now, with Silver members having to wait until September 22nd to give it a go. For those of you far from your beloved console, you can add the demo to your download queue here.